The title of Spanish writer/director Antonio Méndez Esparza’s “Life and Nothing More” asserts to viewers that what they will witness over the next two hours won’t be comprised of tidy contrivances. In his sophomore feature effort, the filmmaker used his script merely as a blueprint, enabling each scene to be formed organically in the moment. Esparza’s aim is to capture nothing more than the relentless flow of “life itself,” a term famously selected by Roger Ebert for the name of his 2011 memoir and its subsequent 2014 cinematic incarnation. Through Esparza’s clear-eyed artistry, scenes merely move from one to the next in a linear fashion, often stopping mid-conversation. Each one is guided by the experiences of nonprofessional actors whose performances are as assured and richly nuanced as those of any industry-branded Oscar contender. Like director Bo Burnham—who credited his 15-year-old leading lady, Elsie Fisher, as the co-author of their masterful junior high-set portrait of modern anxieties, “Eighth Grade”—Esparza seeks to understand the hearts and minds of people who are different from himself. His movie is a living testament to Ebert’s belief that cinema, at its best, can serve as an empathy-generating machine. 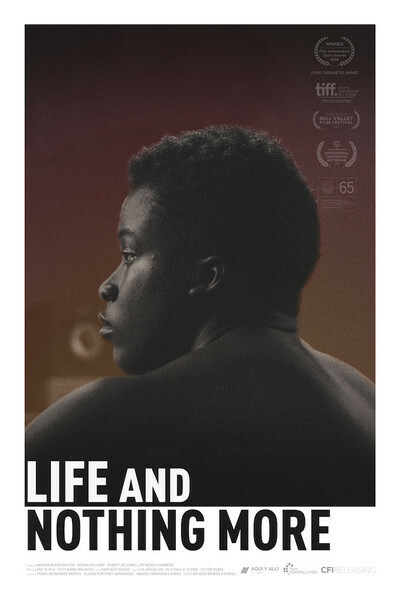 After earning Film Independent’s John Cassavetes Award during the Spirit Awards ceremony held this past March, “Life and Nothing More” is finally receiving a theatrical run in the U.S. just as the current Oscar season is heating up. Though Best Actress buzz is already favoring the expected list of familiar names, there are at least two nonprofessional contenders who deserve to be in the mix: Yalitza Aparicio, star of Alfonso Cuarón’s upcoming “Roma,” and Regina Williams, the stunning Spirit Award nominee in Esparza’s film. Many of the characters, particularly the four leads, share the same first name as the actors playing them, and Williams’ portrayal of “Gina,” a waitress struggling to provide for her children in Leon Country, Florida, is a tour de force on every level. At first, she strikes the viewer as a volatile mess, yelling at her 14-year-old son, Andrew (Andrew Bleechington), about his failure to clean the kitchen before warning him not to wake his three-year-old sister (Ry’Nesia Chambers) sleeping in the next room. Her outburst is all the more maddening when juxtaposed with the scenes that come just before it, showing Andrew diligently taking care of his sister, bathing the girl before reading her a bedtime story where a mother voices pride in her child’s achievements. It’s only after we follow Gina during her arduous routine that we begin to fathom the mounting frustration coupled with exhaustion that fuels her rage. With her husband imprisoned on charges of aggravated assault, the woman’s high school diploma has left her with limited options regarding how to keep her family afloat. So closed off has her personal life become that she immediately deflects the advances of a kindly stranger, Robert (Robert Williams, no relation to Regina), as soon as he shows interest in her. I’ve watched Esparza’s film twice now, and its greatness reveals itself even more upon second viewing, upending the biases we may have developed about certain characters. Even the white couple’s actions, while misguided and bullheaded, have tangible motivation not painted as purely villainous. The county where “Life and Nothing More” is set has the highest crime rate per capita in all of Florida, a statistic that engenders paranoia of all inhabitants deemed unfamiliar, even those who mean no harm. When I first saw the movie, I tended to view events from Andrew’s perspective because that was how they were framed by the camera. In a shot where he confronts Robert about a squabble he had with Gina the previous evening, the unwelcome boyfriend’s body is almost completely out of view, save for his head visible just above the surface of the kitchen counter. The staging here reflects Andrew’s own unwillingness to really see Robert for the attentive man he is, rather than the scoundrel with ulterior motives he presumes him to be. Of course, Andrew has no reason to trust any father figures in his life, and that disillusionment causes him to pick a fight that will get Robert tossed out of the house, just as the white dad starts an argument in order to remove the black stranger from the park.